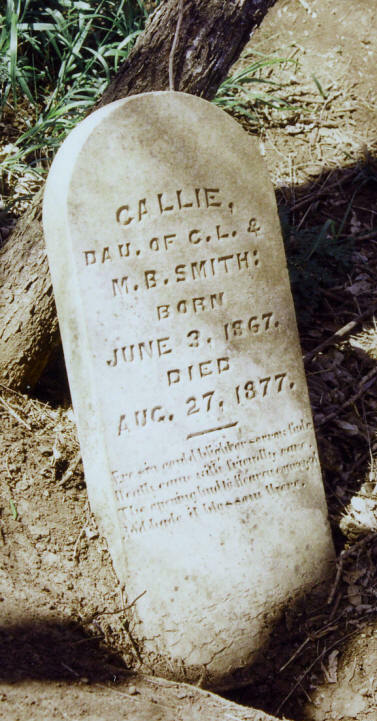 This cemetery is located about 1 ½ miles south of US 380 with the Collin/Denton County line to the west. The fenceline down the west side of the field is probably the county line. The deed for the cemetery even says, "From the Denton County line go east 1 chain." It is very obvious that the road to the cemetery is impassable when it is wet. At one point you cross over a creek. The people, who farm the land, live in Denton County in the second farm on the south, west of the county line. The cemetery is surrounded by a wire fence. It is deeded in Vol 200, p 614. 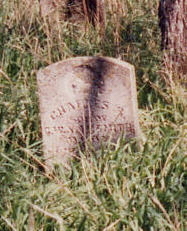 The fields around the cemetery are used by cattle, but there is no evidence that the cows have been in the cemetery. The cemetery is neglected. A few of the stones are down, and there are large holes from animals. 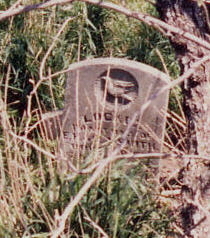 The farmstead for the Smiths is intact on the north side of the dirt road about 300 yards southeast of the cemetery. The house is gone, but the old wire fence and flowers remain, as well as the storm cellar and the barns and out buildings. The silo is probably new. I have heard of people coming in from US 380. There was a Smith farm there that had a large beautiful house. When the family moved to town, the house burned. People would go to that house, and walk through the fields to the cemetery. Someone said that they had heard that there is to be development in the area. I did not see any evidence of that. The power plant is no longer in operation.